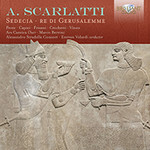 Here is an intriguing discovery: a vivid, compelling oratorio (or “spiritual melodrama”) performed in Rome in 1706 (although first performed in Urbino in 1705) when Alessandro Scarlatti (1660-1725) was at the mid-point of his prolific career which eventually produced 63 operas and many other works. Sedecia is the biblical Zedekiah, King of Jerusalem. He was placed on the throne by the regional warlord, the Assyrian king, Nebuchadnezzar (Nabucco), but later attempted an alliance with Egypt, Assyria’s main enemy. This prompted the action recounted in the oratorio. The recording dates from 1999 (has it ever been released before?) and it contains a satisfying degree of musical energy. One could wish for a greater degree of expressiveness from two of the singers, however. In the title role, alto Amor Lilia Perez seems so focused on handling the challenging vocal lines that she fails to establish Sedecia’s reckless stubbornness. Bass Marco Vinco nicely voices Nabucco but a degree of menace would be welcome. Soprano Alessandra Capici is just right as the justifiably fearful wife, Anna, and Rosita Frisani as the foolhardy young boy. Tenor Mario Cecchetti impresses as the faithful general, Nadabbe. Estévan Velardi brings forth maximum liveliness and colour from the orchestra and chorus. This work gives an intriguing insight into the music of Scarlatti. It is of interest to note that Handel was in Rome around that time and this is where he wrote his first oratorios. He is known to have attended performances at Cardinal Ottoboni’s palace and one wonders if he was familiar with it. The Brilliant Classics website has the libretto with English translation (but not side-by-side).